Bust out your best Irish jig, St. Patrick’s Day is just around the corner! 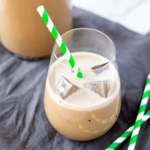 But, before you head to the store for a bottle of Irish cream to mix into your favorite drinks or recipes, read this blog post! You might just want to make a batch of this dairy-free Irish cream once you learn what’s in the store-bought stuff! Irish cream is traditionally a blend of heavy cream or milk, Irish whiskey, and a touch of chocolate. Sounds innocent enough, right? After looking into the ingredients (which aren’t required by alcohol companies) and nutrition information I realized store-bought Irish cream was getting the big Leprechaun boot. There are over 120 calories in each 1.5oz (shot) of Bailey’s Irish Cream, including 10 grams of sugar. That doesn’t sound like a lot, but considering you normally mix Irish cream into other drinks or recipes, it’s pretty high. Bailey’s is transparent about where they source their dairy (Irish creameries) and sugar (beet and cane), but when they start talking about their chocolate flavoring (yes, flavoring), things start to get a little fuzzy. I understand companies like to keep their proprietary recipes close to the vest, but I can’t get on board with mysterious flavorings. So, rather than avoiding all of the Irish cream recipes and drinks on St. Patrick’s Day, make this healthier dairy-free Irish cream instead! 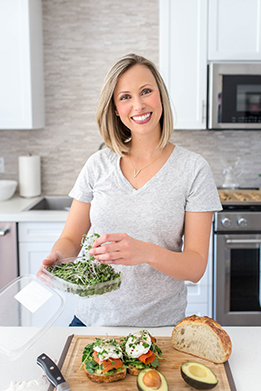 You have complete control of the ingredients, and no flavorings, gums, or refined sugar needed. Use a high-powered blender to blend coconut milk and cashew milk create the ultimate creamy consistency, and thanks to the use of coconut nectar or maple syrup, you can keep the glycemic index relatively low. I also used an organic raw cacao powder for that perfect chocolate kiss of flavor. It’s time to celebrate the luck o’ the Irish! 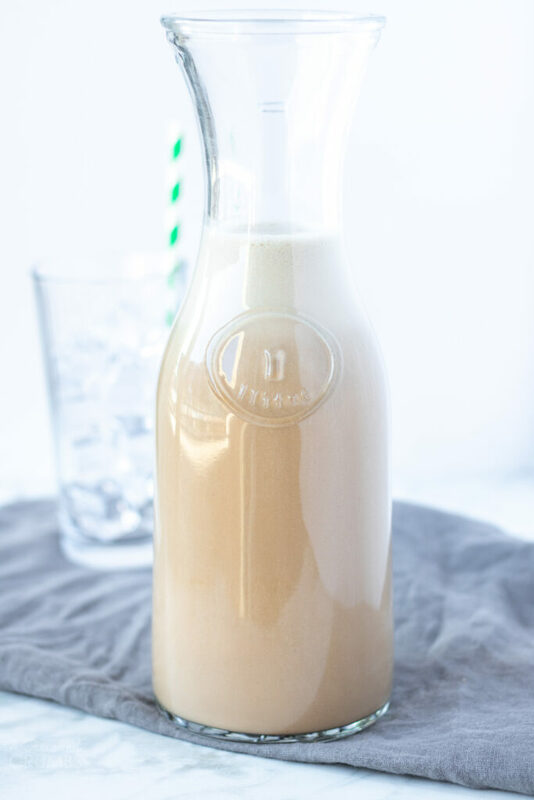 A healthy alternative to traditional store-bought Irish cream, this recipe has no fillers or gums, and no refined sugar. 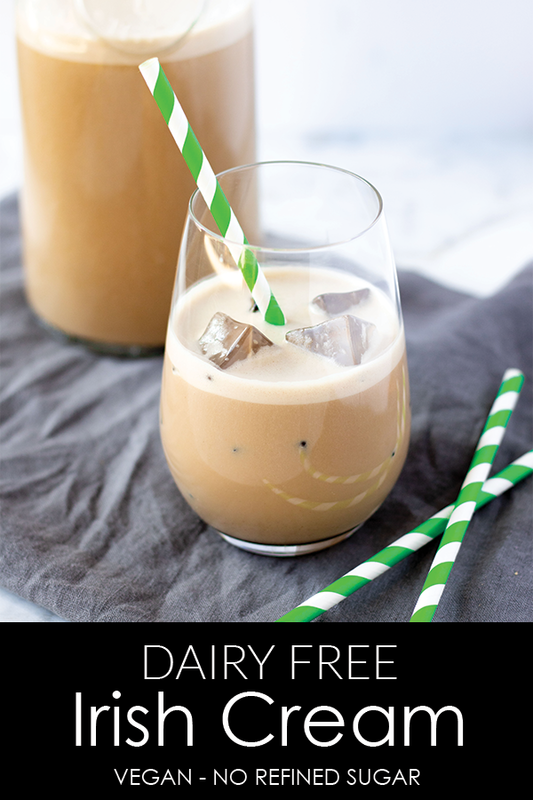 It is the perfect dairy-free Irish cream recipe that is just as delicious over ice as it is in your favorite coffee beverage. Shake the can of coconut milk vigorously. Empty it into a high-powered blender along with the non-dairy milk of your choice, whiskey, cocoa powder, and sweetener of choice. Blend on medium-high speed for 30-60 seconds. Irish cream will keep in your fridge for 1-2 weeks. Shake well before each use.